Unnata pronounced ooo-NOT-ahh, a Sanskrit word meaning "elevated,"combines yoga with aerial acrobatics, and uses a hammock-like fabric trapeze to prop up or fully support a person, enabling swinging in the air. Developed by dancer and yoga instructor Michelle Dortignac, Unnata, is a new practice that aids proper alignment by strengthening shoulder and core ab muscles whilst increasing shoulder and spinal flexibility all without strain or pain. 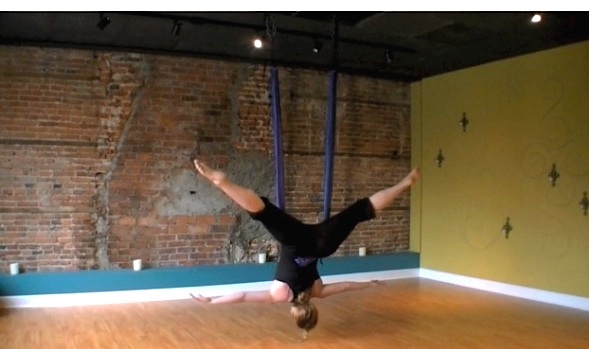 To the tune of some groovy music, Kim Henry of Morristown NJ, demonstrates in the video here, some of the possible moves one can practice, like counteracting gravity and achieving challenging yoga postures and inversions.